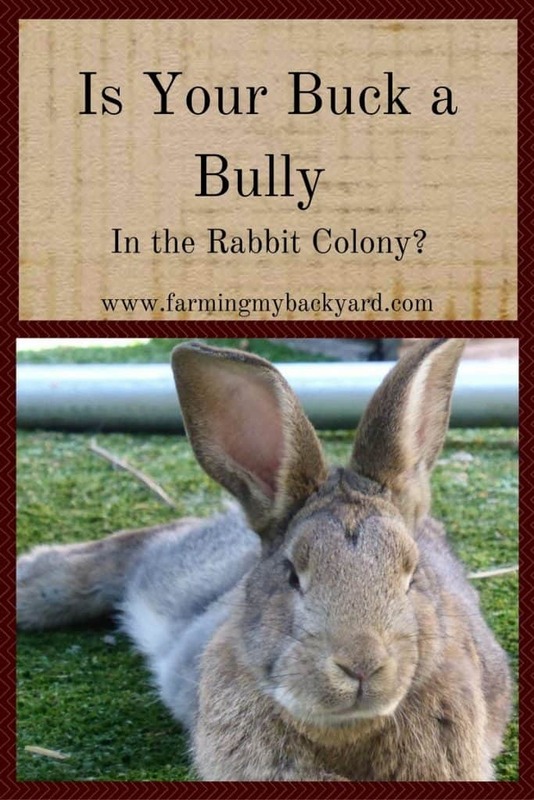 Is Your Buck a Bully In the Rabbit Colony? If you keep your rabbits in a colony, you may have some questions about your buck’s behavior. When people say something breeds like rabbits, they aren’t kidding! The rabbit buck is anxious to procreate the majority of the time, and he doesn’t always care about the doe’s opinion in the matter. There are good and bad aspects to including your rabbit buck in your colony. Should You Put Your Rabbit Buck In a Colony? I tried our rabbit colony both with our buck Zeddicus and without him. I prefer having him in the colony because he is able to socialize with the other rabbits. They do practice social grooming, and enjoy some companionship. My rabbits were in a colony situation most of their lives, even before I brought them home. Whether that’s the cause or the effect, I do not know. My buck didn’t seem to mind the babies. I would come out to feed them and he would have a couple little ones asleep on his back. It was pretty adorable, but every time I ran back to get my camera they’d come running up to me for snacks. Not all rabbit personalities were well suited to a colony, but this is something you can select for when breeding and culling. Or Should He Have His Own Space? Some rabbits when kept with a buck will breed back the very day they give birth. Mine never did this. They had 2-3 months between litters. This could have something to do with the fact the colony was located in my garage and didn’t have as many hours of daylight as it would have if it was outside. The likelihood of fighting increases if you have multiple bucks and too few does they will fight, so send those young males off to freezer camp before they reach sexual maturity at 12 weeks. Bucks will harass the does a bit. Mine would chase them around and around in circles. They were so annoyed with him! That would go on for a few days and then one or the other would give up and they’d be friends and snuggly and grooming each other. One issue I did have was him harassing a doe while she was still giving birth. I had a mis-sexed second buck in the colony with them, so that may have had an influence. Her nest also wasn’t in a very defensible or private spot. If you do have your buck in the colony, make sure there is plenty of space, and hidey-holes. The does will claim and defend these as their own. What About A Part-Time Colony? Some colonies include the buck in the center of the colony but in a cage. He is still able to interact with the other rabbits through his cage, and they can smell each other’s scent, but he cannot breed them. When it’s time for breeding, let him into the colony for a few days. This way you can plan ahead and time when babies will arrive. Another option is to keep him in his own pen. If you do this, bring the does out of the colony and to him when it’s time to breed. If you do separate them and the does are not receptive to breeding, you may want to bring him close enough for the does to catch his scent. Whether or not a buck is included depends on the goals for your herd, as well as the individual personalities of your rabbits. Do you include your buck or not? Share in the comments! Well, we learn by our experiences don’t we. I only had 1 rabbit many years ago and it would be a lot to learn and a lot of space I’m sure. I only have a small yard 🙁 I really should live on a farm, but too old to move and start all over again. lol. 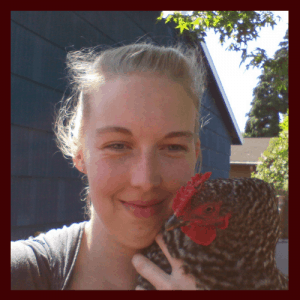 But I am going to get a small jutch for 3 chickens in the spring. Love reading the blog. I’m glad you are enjoying it! Congratulations on the chickens. I hope you enjoy them! That’s the nice thing about a few chickens and rabbits is they don’t need a huge property. been learning a lot from your site! we just started our rabbit colony last month (we had them in cages until this point). The buck chased the girls around initially for a day or two, but really everyone has gotten along fine. But now our 3 does are pregnant and about to give birth (one is pulling fur as of this afternoon) and now the buck is going crazy trying to hump them (as of yesterday). he seems to really be annoying them. he’s not hurting them though. I’m wondering if I should leave him in there when they have the babies, or if he will upset the process. I DO believe that normally he keeps the peace in the group, and I’m a little concerned the does may fight without him. not sure what to do. I also have one mama who has pulled fur but out in the open. I’m concerned she won’t have her babies in one of the nest boxes, and I don’t want them to get trampled by the others. If she DOES have them outside of a box, is it ok to move them, or to put a box on top of where she had them? (I use the animal carriers,split in half, and have some big ones that are just a top and 3 sides, so I could slide it right over) Don’t want to freak her out and make her abandon them though. They are all first-time mamas so I’m not really sure what will happen here… any advice would be appreciated!! tia! If he’s being obnoxious you can put him in a cage within the colony until after they kindle, or pull him out but put his cage right next to where you have the colony set up and then put him back in after they are done. When it’s cold out I like to keep the bottom of the colony (or cages) covered with a thick layer of hay so that if they pick a spot outside the boxes it is still warm. It sounds like you can just put a carrier right over the top of the nest and it will be fine. I’ve moved nests and babies into different spots. I’ve noticed they are less bothered if I move things around after they are finished birthing. The only time I had a baby rejected by mom was when it was a singleton and I was trying to move MOM into the house to feed it. The most important thing is to just make sure they are nice and warm and covered with lots of fur. I hope everything goes well! Might as well try to save them because they won’t survive without a nest. I’d cover them with fresh hay and a carrier lid. Wash off any buck sent from anything you introduce to a nest. Misplaced aggression could be a problem. You can sometimes move an entire nest if the Doe is commited, but I have the best results with improving the original nest site. I’ve had entire litters survive outside the box by stuffing hay under them and providing as much privacy as possible. You can also cut a door hole in a rubbermaid tub and put it upside down over the nest for more privacy. thanks so much for writing me back! Our colony is in our old barn. they have some levels and the whole floor (covered in chain link and hay). we put the buck in a large dog crate in the center of the colony last night, and the does seemed happy about that (though not him!) all three does had babies last night. one left hers uncleaned and out in the open and they didn’t make it, but two built great little nests! one is even in a box. (I’m pretty happy about this since all are first timers!) I wanted to ask you though, the nest box she picked is the bottom portion of a small carrier. it is tall enough for her to get into NOW and nurse them, but I’m afraid she will squish them after too long. there also aren’t any air holes in this carrier, only the open front side, which is covered a lot of the way with hay. Should I be worried about them getting enough air in there? or about her squishing them? I could always move a taller nest box over the one she’s using… but she did such a good job, and the buck can’t get in there (which is probably why she picked it) so I don’t want to switch it if there’s no need. (sorry I am such a worry wart sometimes! just want to make sure I do right by those babies.) My lops have been double pregnant before, so I thought it would be best to keep the buck out til tomorrow morning, in case they kindle again (from what I’ve read, they should have the babies within 24 hrs of each other, generally. Is this true for you?) that would be about 36 he’s been separated. think this is a good idea or is that too long to keep him in the cage? I SO appreciate your site, your advice, and your prompt response yesterday. I know a lot of people raising rabbits, but no one that does so in a colony set up, and I’ve found very little information about colony raising with the buck included. So thank you!! a lot!! 🙂 you are a blessing to me! Sorry to hear about the litter that didn’t make it, but hooray for the ones that did! I can’t really visualize what the nest box looks like, or if it would be a problem. If it’s easy to switch might as well if you’re worried. Facebook a couple of good groups on colony raising rabbits. I especially like looking at the pictures people share of their colonies. I haven’t noticed my does with double litters, although I know it’s possible. When you do let the buck out stick around and supervise for a bit just in case. As long as the cage is big enough for him (no smaller than 6 square feet for regular sized rabbits) he can stay there. thanks for all your help! we let the buck out after about 72 hours in his own crate, and he was fine – just a bit horny but once the girls let him do his things all was mellow. it turned out that the dead babies I found were from our Lop mama. she made a great nest for her first babe, but then ditched the next four. they came at three separate times, so I’m thinking she had some kind of problem with her labor? she’s taking great care of her first one though, and the other mama has had her babies as well, and she’s doing great with those. I did switch the nest box… everyone checked it out for a bit but then the rest left it alone, and mama knew right where her babies were. this has been a really fun, interesting experience so far. The babies are just starting to come out of the nests into the colony, which is making me a little nervous as our Lop mama still likes to chase the others sometimes, and I’m afraid she may hurt their babies as well. There’s been no real fighting though, just some chasing, and the white mamas are very submissive to her. have you had any issues with dominant does hurting babies of the others? That’s my only real concern at this point, as the mamas seem to be taking care of them quite well. I will check out those fb groups too and thanks again! Oh I’m glad it is going well so far. None of my does paid any attention to the other kits. Hopefully the groups might have someone with a similar experience. I am in the process of building a new colony rabbit run (we moved >sadness<) and I was thinking of doing some sort of stall for each of my bucks so that I can have the bucks in the yard but still separate from all the does that they can safely breed (no daddy to daughter stuff). I have 4 bucks and a LOT of does right now… I probably have more bucks than that but only 4 we are keeping. I was thinking I'd make the stalls out of those shelving squares so that the bucks can still see the does and get a little nose to nose time. I'll let him in with them for two weeks when I want babies and then put him back. Long run down the length of the whole thing for a grow out pen- half for does half for bucks. Then I can sort out who is good for breeding and who is good for eating. Really hate that part but kids gotta eat by money or meat! Wish I could attach a picture to show the design I have in mind, but I hope it helps anyone who might want to do the same. Oh, I love the idea of stalls. I wanted to ask a quick question. We have a colony that we set up about a month ago and one of the does was already pregnant, so we allowed her to give birth and have two weeks before letting our buck out with the 3 colony does. We let him into the colony today, and so far everyone is getting along. However, two of the does are very adamant against being bred. They growl or nip and once they get away, he does not pursue them. This is why it’s been peaceful, but certainly not productive. The 3rd doe has just reached her adult weight and is not mean toward the buck, but has not clue what her part to play in this transaction is. So I assume that the natural setting, the relationship the rabbits will build, and time will all eventually lead to successful breedings. But what is your experience? Does most of the action that leads to litters happen at night? Are does more receptive during certain times? Being near a buck and smelling him for a few days can help. Some people will hold the doe down, but I prefer just to wait and eventually all mine have figured it out on their own. It’s also possible he bred them when you weren’t watching and will have babies on the way, too. I’m thinking of starting my lion head rabbits colony style. I have 1 buck and 1 doe and thinking other getting more. My doe has had a litter before and is a good mom, but I’m not so sure about my buck. The other buck we had died and the buck we have now is only 5 months old. I’m just worried what might happen if he finds the babies. Is it common place for bucks to be friendly with babies, or can they be aggressive? There’s really no way to know for sure. Generally bucks that are raised in a colony do okay, and you just have to try with your buck and see.